If your favourite part of Gilbert and Sullivan is all the slapstick, sight gags and explosions, then Stratford’s new production of The Pirates of Penzance is the one for you. If, however, you like Gilbert and Sullivan because of W.S. Gilbert’s clever lyrics and Arthur Sullivan’s equally witty music, you will find the current production disappointing and ill-conceived. 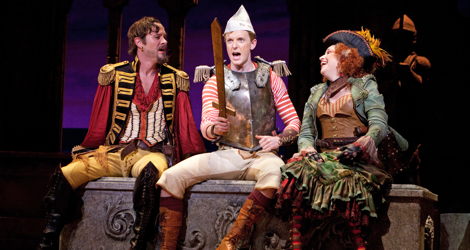 With Pirates the Stratford Shakespeare Festival is presenting its first fully staged Gilbert and Sullivan operetta since the second revival of Brian MacDonald and Susan Benson’s The Gondoliers in 1995. The current Pirates directed by Ethan McSweeny and designed by Anna Louizos and Paul Tazewell is simply not as good as the four MacDonald-Benson G&S works of the 1980s that helped revolutionize productions of Gilbert and Sullivan by creating witty staging that complemented but never overwhelmed the wit of the music and text. In his Director’s Note, McSweeny, who directed Dangerous Liaisons at Stratford in 2010, says that this is his first foray to Gilbert and Sullivan. (If so, one wonders why he was hired.) It is hard to believe that he and his designers did not study the DVDs of the MacDonald-Benson G&S works closely. The most obvious influence on his production is the Iolanthe of 1984. In both the set is presented as a set with onstage wings visible on either side. In both we see the backstage action onstage during the overture until the curtain rises and the performance begins. The concept in both is that we are watching a late 19th-century company staging the operetta with all the stage machinery visible. While the new Pirates uses old-fashioned painted drops as did Iolanthe, it adds two wooden towers upstage with a wooden bridge between them that can be raised and lowered. This is meant to suggest the pirates’ ship itself during the first scene and scaffolding around the ruined chapel in Act 2. Musically, the new Pirates has serious problems. While Sean Arbuckle as the Pirate King, Kyle Blair as Frederic, Gabrielle Jones as Ruth, Jordan Till as Samuel and Steve Ross as the Sergeant of Police all have strong voices and sing their parts well, C. David Johnson as Major-General Stanley and Amy Wallis as Mabel do not. Since the latter two have the showiest numbers in the operetta this is a major failing. Johnson’s singing has never been his strong point (viz. his Captain von Trapp in Stratford’s The Sound of Music in 2001), so it is odd he should be cast in an even more difficult role here. In the archetypal G&S patter song, “I Am the Very Model of a Modern Major-General”, not only does he lose the rhythm part way through but muddles some of the words – a definite no-no at anytime but especially in G&S. A real singer like David Ludwig in Toronto Operetta Theatre’s production last year was able to deliver an encore by singing the Major-General song in double time. Since Johnson can’t cope with the song as it is, such a display of virtuosity is out of the question. His rendition of “Sighing Softly to the River” in Act 2 with all its sustained notes is rather a painful experience. Mabel is the showiest role in all of G&S, but Amy Wallis is just not up to it. Her voice is thin and weak and she can only squeak out Mabel’s frequent high notes. Wallis is just fine in the undemanding role of Sally in You’re a Good Man, Charlie Brown, but the role of Mabel requires a real coloratura soprano with an operatic range and strength. With such as singer as the TOT had in Jessica Cheung in its production last year, Mabel’s bel canto runs and trills can be extended to both humorous and impressive lengths. But with a Mabel who can barely get through her signature tune, such fun has to be omitted. What is most surprising is poor sound the 19-member orchestra produces. One would never guess it was largely the same band that sounded so brash in 42nd Street. In Pirates the sound is so tinny and thin, you’d think it came from a high school group unable to afford better instruments. The reason must be poor sound engineering, but if that is so why wasn’t it fixed during previews? One aspect of the music that is successful is the use of a three-person band onstage of violin, guitar and concertina to accompany some of the songs. This brings out the aspect of folk music in Sullivan’s songs that often goes missing and helped evoke a Celtic atmosphere – Penzance, of course, being situated in the county and Celtic Nation of Cornwall. Sadly, for unknown reasons, this band disappears in Act 2. Dramatically, McSweeny can’t leave well enough alone and feels the need to add gimmickry to nearly every song in the show, even when it contradicts the lyrics. The worst example is in Frederic’s plea “Oh, Is There Not One Maiden Breast” that continues, “Whose homely face and bad complexion, Has caused all hope to disappear, Of ever winning man’s affection?” To this the gathered maidens reply “No, no, not one”, after which Mabel makes her big entrance with “Yes one.” McSweeny, however, decides to have one maiden with missing teeth respond to Frederic’s request, thus making nonsense of the girls’ reply and spoiling Mabel’s entrance. In Act 2 he gives the kilt- and sporran-wearing policemen so much slapstick business that they pay little attention when Mabel sings, “Go to death, and go to slaughter; Die, and every Cornish daughter With her tears your grave shall water. Go, ye heroes, go and die!” The humour should lie in the contrast of Mabel’s romantic enthusiasm versus the policemen’s lack of it, but if they aren’t listening this goes completely missing. In “How Beautifully Blue the Sky”, Major General Stanley’s daughters are busy flying a kite rather than making small talk as the song states. In “With Cat-Like Tread”, the pirates are so busy fussing about hauling a small canon on stage that the humour of the fortissimo marking of the song versus the sense of the lyrics is lost. In the policemen’s Gregorian chant-like responses before the Sergeant’s signature tune in Act 2, McSweeny has the chorus accompanied by a policeman playing a drone on a bagpipe but forgetting to breathe so that he gradually sinks down into a faint (ha ha) meaning our attention is drawn, yet again, away from the lyrics. Indeed, “Hail, Poetry!”, “When You Left Our Pirate Fold” and “Ah, Leave Me Not To Pine” are the only three songs McSweeny allows to be sung straight and unmarred with his extraneous visual jokes. McSweeny and his designers claim that the production design was inspired by the steampunk movement, but except for the clock with visible gears that hangs over the proscenium, it’s hard to see that the costumes are anything but ordinary period Victoriana. The prime exception are the women’s wedding dresses at the end of Act 2 which rise above the knee – peculiar in our own time let alone in the Victorian period and incomprehensible given that the same women were embarrassed in Act 1 even to have their ankles seen. Some might think that the pepper-box revolver Ruth wields in Act 2 is a steampunk invention, but such devices, in fact, were manufactured well before Pirates was first produced. All in all, McSweeny’s production is a concatenation of one visual distraction after another. It resembles the productions of too many comedies at Stratford where the director promotes his own miscellany of jokes at the expense of the humour in the text. The famous MacDonald-Benson G&S series of the 1980s still remains unsurpassed and I was pleased to be able to tell Brian MacDonald just that when I saw him the following evening. Photo: Sean Arbuckle, Kyle Blair and Gabrielle Jones. ©2012 Cylla von Tiedemann.